By two o'clock on a Wednesday afternoon, Scott Burgwin and a small crew of volunteers have set up the Coast Fork Farm Stand in Cottage Grove's Coiner Park. Burgwin volunteers as coordinator of the Cottage Grove Growers' Market during its summer season, when it shares Wednesday evenings with a series of concerts in the park. "The music has given us a lift," says Burgwin, who moved the market from Saturdays downtown to Wednesdays in the park six years ago. 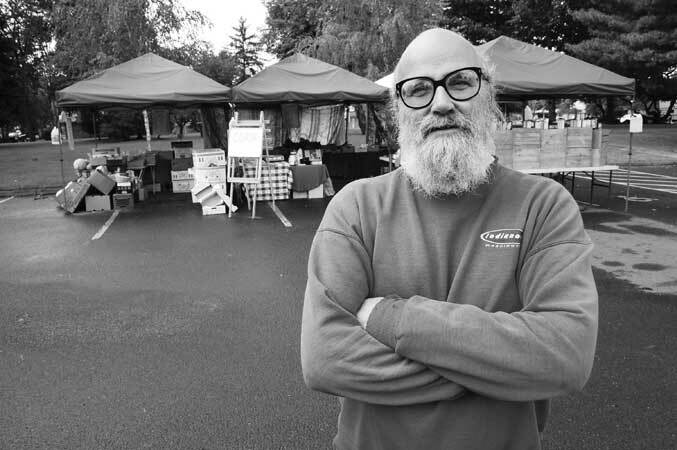 A year later, he launched the year-round twice-weekly outdoor farm stand to provide consignment space for small farmers and specialty food producers. A graduate of Madison High in Portland, Burgwin was working for the Forest Service in the Olympics of Washington when he met former classmate Birdy Hoelzle, then a 25-year resident of Cottage Grove, at a school reunion. He moved south in 2002. Now that the Growers' Market season is done, Burgwin is preparing to move the Coast Fork Farm Stand to a new permanent indoor/outdoor location, as part of a community market and local food hub planned for two adjacent buildings across the street from Bohemia Park. Organizers will host the "Food Hubbub," a variety show and fundraiser to support the new development, at the Axe and Fiddle in Cottage Grove, on Sunday, October 6, beginning at 5:30 pm.